This will be our fourth meet for 2019, and we welcome all TCA members, their families, and any interested guest toy train collectors to come and meet our membership, browse the trading tables for bargains, and share in the camaraderie of toy train collecting. The trains will be running, and there will be lots of raffle prizes given away. The hall doors will be opened at our normal time of 10:00 A.M. There is plenty of free parking, and refreshments are available. For a detailed listing of all upcoming meets, click here. 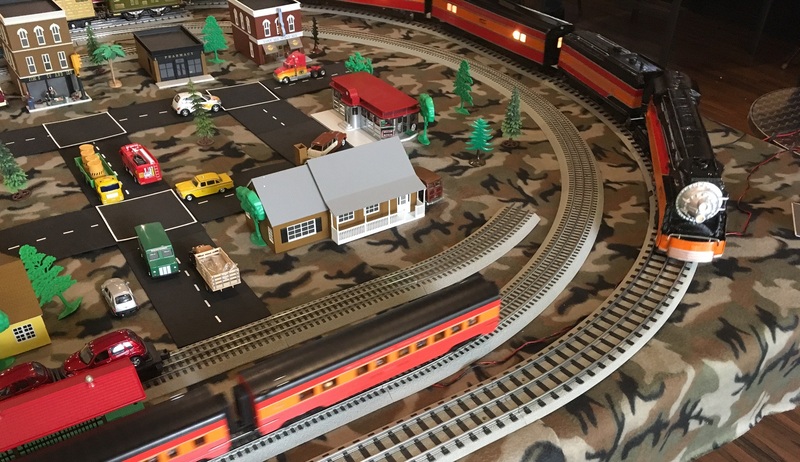 Please enjoy this video of the layout set up by TCA members Steve Eastman, Jeff & Denyse Meyer for our March meet. The Standard gauge Daylight 4-8-4 is produced by Lee Lines Trains. The mission of the Train Collectors Association (TCA) is to develop an appreciation of and to preserve an important segment of history - tinplate toy trains - through research, education, community outreach, fellowship, establishment of collecting standards and to promote the growth and enjoyment of the hobby of collecting and operating toy, model and scale trains. The By-laws of TCA Western Division are viewable by clicking here. TCA Western Division carries out this mission by holding 10 monthly meets during the calendar year. At these meets, the trading and displaying of tinplate toy trains and toy train related items takes place. TCA Western is the only Southern California based toy train club that provides free use of tables for these purposes. We have plenty of them available, in a well lighted, spacious hall. There are over 30,000 members in the TCA organization nationally. Western Division boasts a membership of over 300 train hobbyists. TCA and Western Division have been in existence since 1954. For a little bit of history about TCA Western Division click here. Do you have a box of old tinplate trains that you have been storing in the attic all these years since your childhood? Are you anxious to break them out and run them again? Do you need help in getting your old trains to run again - perhaps they require some servicing? Have you been meaning to perhaps convert those old trains into some cash in your pocket? Then bring those trains to our next TCA Western Division toy train meet in Arcadia. Those dusty old electric trains could potentially be something rare and unusual. The club layout would be a great place to see those trains running again after all these years. Or, if you have intended to get rid of those trains, selling them at the TCA Western Division meet can yield cash for you and make a collector happy as well.